Producer. Nationality: American. Born: Jack Leonard Warner in London, Ontario, 2 August 1892. Education: Attended schools in Ohio. Family: Married 1) Irma (Warner) (divorced 1935); 2) Ann Boyar; one son and one daughter. Career: Worked in brother Harry's shoe repair store in Baltimore; 1905—sang illustrated song slides in nickelodeons; with brothers opened Le Bijou nickelodeon in Pittsburgh; 1906—formed the Duquesne Amusement Supply Company; opened production studios in St. Louis and Santa Paula, California; 1917— My Four Years in Germany established Jack as a major producer; 1918—took sole charge of Warner Bros. Hollywood operation; controlled the studio until 1967, then independent producer. Awards: Academy Awards for The Life of Emile Zola , 1937; Casablanca , 1943, and My Fair Lady , 1964; Irving Thalberg Award, 1958; US Medal of Merit; Order of British Empire. Died: Of heart disease in Los Angeles, California, 9 September 1978. My First Hundred Years in Hollywood , New York, 1964. The Colonel: An Affectionate Remembrance of Jack L. Warner , Los Angeles, 1980. Freedland, Michael, The Warner Bros. , London, 1983. Thomas, Bob, Clown Prince of Hollywood , New York, 1990. Obituary in Hollywood Reporter , vol. 253, no. 12, 11 February 1978. Gabler, Neal, in An Empire of Their Own: How the Jews Invented Hollywood , New York, 1988. Film Comment (New York), vol. 25, no. 4, July-August 1989. "Freedom Fighter," in Economist , 14 October 1989. Lockwood, Charles, "Jack L. Warner: The Beverly Hills Estate of the Archetypal Hollywood Mogul," in Architectural Digest , April 1992. Bart, Peter, "Recalling Jack's Warning," in Variety (New York), 4 April 1994. Stein, Jean, "West of Eden: The Rise and Fall of Jack L. Warner's Paradise," in New Yorker , 23 February 1998. Like most newcomers to the movie business, the brothers Warner began as nickelodeon operators, in this case in western Pennsylvania and eastern Ohio. They struggled on the margins of the industry until the early 1920s; in 1922, on the verge of expansion, the Warner company was but one hundredth of the size of industry leader, Famous Players-Lasky. Harry Warner and his brothers realized they needed to grow or face extinction. So they gambled and copied the strategies that were working so well for Adolph Zukor and Famous Players-Lasky by producing expensive feature films, setting up world-wide distribution, and buying theaters, all backed by the Wall Street banking house of Goldman Sachs. During this initial phase of corporate growth, Sam Warner learned of AT&T's inventions for recording and reproducing sounds electronically. He and Harry Warner devised a means by which to use sound to make their company grow. Warner Bros. would not rock the boat, rather, the company would make recordings of popular vaudeville acts, and offer them as novelties to exhibitors along with Warner Bros. feature length (silent) films. Jack Warner helped supervise these early forays into "talking pictures." Abe Warner's sales pitch stressed that these so-called "vaudeville" sound shorts could substitute for the then omnipresent stage shows offered by picture palaces around the country. Thus, the very first "talkers" were conceived as short recordings of the acts of top musical, comic, and variety talent then touring the United States. This strategy worked. In August, 1926 Warners premiered the Vitaphone with a package of shorts accompanying Jack Warner's latest silent film spectacular, Don Juan , with music on a sound track replacing the usual live orchestra for the feature film. As Warner Bros. developed more "packages of sound movies" (a silent feature film with orchestral music on disc plus "vaudeville" short), the brothers Warner quickly realized the movie-going public preferred recordings of popular musical acts to opera stars. 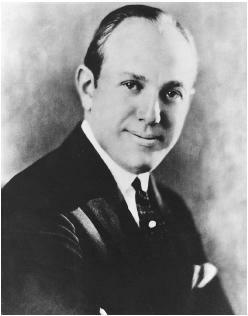 Logically and systematically, Warner Bros. inserted "vaudeville" numbers into its features, the first being Al Jolson as The Jazz Singer , premiering in October 1927. (Jack Warner would make his greatest contribution as a line producer in these pioneering days.) The three brothers Warner knew they had made it into Hollywood's pantheon based on the overwhelming response to a Jazz Singer sequel, The Singing Fool , also starring Al Jolson, released in September 1928. The Singing Fool established box-office records that lasted a decade and took Gone with the Wind to shatter. By the early 1930s Jack Warner had ceased working on individual projects and settled into running thriving sets of studios (in Hollywood and Burbank, California) and hiring and firing talented filmmakers, scriptwriters, and other filmmaking personnel. Because of his distance from actual productions, historians debate Jack Warner's day-to-day impact, but he surely set the direction for studio production. The 1930s and 1940s proved a heyday for Warners. We now properly celebrate the studio for its social expose films ( I Was a Fugitive on the Chain Gang and Wild Boys of the Road ), innovative gangster films ( Public Enemy and The Secret Six ), and backstage musicals ( The Gold Diggers of 1933 and Footlight Parade ). Jack Warner took proper credit for the 1937 Academy Award winner, The Life of Emile Zola. But he also never produced regular profits until World War II brought the film industry out of the Great Depression. From a box-office point of view Warner's films of the early 1930s only helped the company lose more than $30 million. Steady profits only commenced in the 1940s with the release of such popular fare as the Bette Davis and James Cagney comedy The Bride Came C.O.D. ; the romantic Christmas in Connecticut , starring Barbara Stanwyck and Dennis Morgan; a film biography of Cole Porter Night and Day , starring Cary Grant and Alexis Smith; the Broadway hit Life With Father , starring Irene Dunne and William Powell; and Jane Wyman's Oscar winning performance in Johnny Belinda. By the late 1940s there was no one in Hollywood with more power than Jack Warner. The brothers' dynasty began to fall apart with the coming of television. Although the company pioneered in TV production (with such early hits as 77 Sunset Strip and Maverick ) corporate profits began to fall. Harry and Abe Warner had made their fortunes and sold their stakes in the company in the mid-1950s. Jack Warner would stay on to run Warner Bros. for another decade, but worked for other corporate owners. He could not simply appeal to his older brothers and thus never again possessed the power he had from the late 1920s through the early 1950s. He became just another independent filmmaker, occasionally turning out hits such as My Fair Lady and The Great Race. These would prove the swan song for the final remaining member of one of Hollywood's most important families.